Duck is a Samus main from Ann Arbor, Michigan who is considered to be the best Samus player in the world, with wins against other top players such as Hungrybox, Leffen, and Westballz under his belt. He is known for his safe and calculated style of play, getting 5th at The Big House and beating HugS, in pools at Kings of Cali 3. He also managed to take two sets off of KirbyKaze, at SWEET XIV and The Come Up 2014, as well as eliminating Leffen from DreamHack Winter 2015. 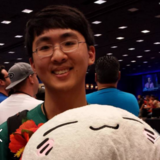 He placed 13th at EVO 2015 and 9th at The Big House 5. His most notable performance was DreamHack Winter 2015 where he placed 5th and defeated SFAT, Wizzrobe, Leffen, and MacD. Duck is currently ranked 1st on the Michigan Melee Power Rankings and 14th on the 2018 MPGR. On August 15, 2016, Duck was signed onto Denial eSports, but left on January 5th, 2017. On April 11, 2017, Duck was signed by Phoenix1. On May 17, 2018, Duck announced he was no longer part of Phoenix1, thanking them for the support and opportunities they've given him. Duck has an even record against Leffen 3-3. ↑ Phoenix1 signs Duck as the team's first Super Smash Bros. Melee player. This page was last edited on March 28, 2019, at 00:16.